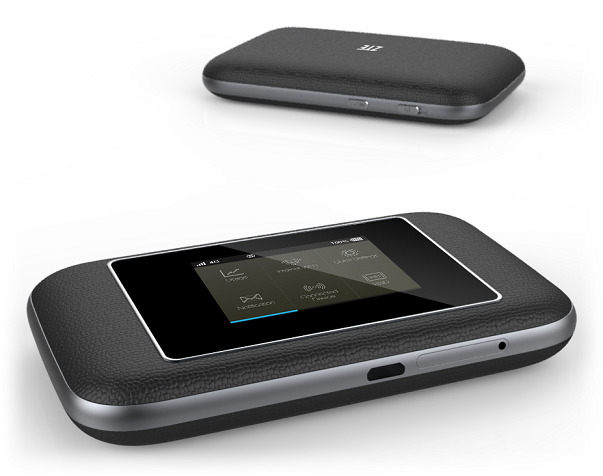 The Chinese manufacturer “ZTE” has already announced a new hotspot router to the Mobile World Congress 2014 that will support LTE-Advanced with up to 300 Mbit/s for the first time. The new hotspot is named ZTE Flare. The device is equipped with the latest wireless technology. Here are the key data details. From 2014 autumn, many European network providers are trying to launch the next generation LTE (So called LTE-Advanced). Based on new technology, the current data rates of up to 300Mbit/s could be achieved. However, in order to use the “LTE 2.0”, customers require new hardware so that the devices could support LTE Category 6. Both ZTE and its rival Huawei are also preparing the new models. Then ZTE announced its first Cat6 device for the second half of the year, named “Flare”. ZTE Flare is called WiFi hotspot router, but it’s designed for mobile use and allows multiple users to share the wireless network through it. More powerful than Huawei E5786 LTE Cat6 mobile hotspot, ZTE Flare could support maximum up to 32 users to access internet. Based on the LTE Category6, the peak speed of 300Mbps will provide good surf experience for the users. ZTE Flare is the world’s first device that uses Gobi chipset from Qualcomm, more specifically; it’s the “Gobi 9×30”. It’s made in ultra-thin 20nm process and consumes less energy than conventional radio chips. It’s said the new chipset will save almost up to 15 percent power. Per the LTE-A support and carrier aggregation, the qualcomm chipst can combine two RF bands of different spectral ranges, so that the LTE providers can operate up to 40MHz total bandwidth for data transmission. According to 3GPP standard, tapes 5, 10, 15 or 20 MHz are combines. In this way, data rates can reach up to 300mbps. The Gobi dominates beyond FDD and TDD modulation. The former is common in Europe and North America, the later specially in the Asian region. Of course, according to the latest AC standard, ZTE flare can supports up to 540Mbps based on installed VIVE 502.11ac WiFi chip from Qualcomm. The WiFi chipset is compatible with previous 802.a/b/g/n and can be operated at 2.4GHz or 5GHz. As mentioned before, the flare hotspot allows end users of up to 32 devices. There are two additional ports for connecting external antennas (TS-9 socket). Like other mobile hotspot router, there is a LCD screen on the front and users can see many important connection information, such as surf duration, radio standard or consumed volume. Many people want to know which one is better between ZTE Flare and Huawei E5786, we will give full explanation after we get the samples of them. Following the commonly deployment of 4G LTE network worldwide, more and more 4G terminals are demanded by the operators. As one of the important vendors, ZTE had gained many business plans from the operators and its wireless gadgets are also very popular. ZTE MF93E and ZTE MF91D 4G LTE mobile hotspot are two models for 4G LTE networks. Sometimes, most customers may know the model number of the UEs. But they don’t know whether the 4G modems or 4G routers would work with the providers in their countries. Today, we will have a review of the two models ZTE MF93E and ZTE MF91D. 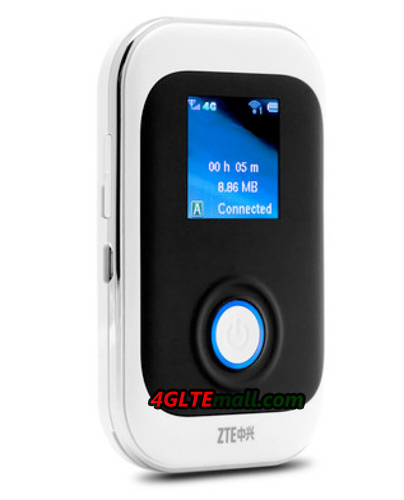 ZTE MF91D 4G Hotspot is earlier available in same countries, it’s mainly European 4G networks. MF91D Hotspot supports 4G FDD band 7, band 8 and band 3 (900/1800/2600MHz); they are the most popular three spectrum band in European area. And the 3G UMTS & 2G networks are backward compatible. ZTE MF93E 4G Mobile Router is a LTE dual-mode (TDD & FDD) WiFi Hotspot. It supports TD-LTE band 3 & band 7 (1800/2600MHz) and FDD bands 38 & band 40 (2300/2600MHz). Based on this specification, MF93E hotspot router is more suitable for the 4G networks in Asia and Middle East areas, such as Hong Kong, Saudi Arabia, Kuwait, China etc.. Just like MF91D, ZTE MF93E dual-mode TDD/FDD hotspot could also works on 3G UMTS 900/2100MHz and 2G GSM/GPRS networks. The appearance of ZTE MF93E and MF91D looks not the same. MF93E is in the design of horizontal, but MF91D is in vertical design. To make the device more user-friendly, the both have only one button in the front. And there is OLED screen to indicate the important information, including network status, operator, WiFi connectors, battery life and data statistics. The batteries in the body are removable and re-chargeable. ZTE MF91D 4G Pocket Router could reach peak download speed up to 100Mbps and upload speed to 50Mbps on 4G LTE FDD network. It could allow up to 10 users access Internet simultaneous. ZTE MF93E has the same functions like MF91D when it’s on FDD mode, however, when working on TD-LTE network, MF93E could support maximum download speed up to 68Mbps and 17Mbps for upload. Above are the important features of the 4G Pocket WiFi that matters the user experience, if you want to buy unlocked ZTE MF93E or MF91D, welcome to land www.4gltemall.com .